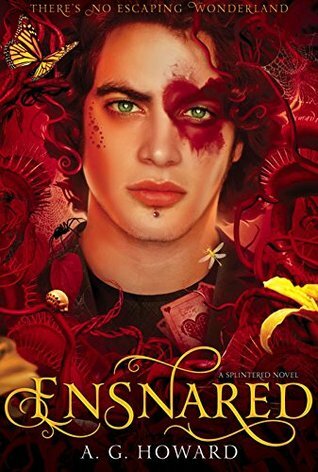 Ensnared is the final book in the Splintered trilogy by A.G. Howard. 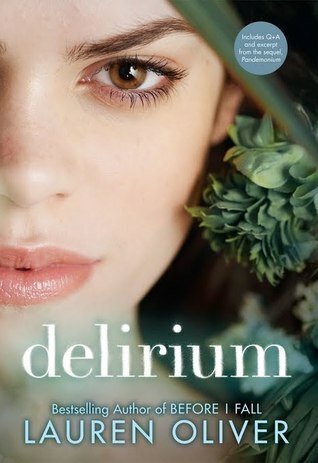 In the final installment, Alyssa travels into the looking-glass world, where everything is distorted and backwards from Wonderland, to save her human Knight and her Wonderland King. I honestly hated most of this book. I had to force myself to finish reading it. 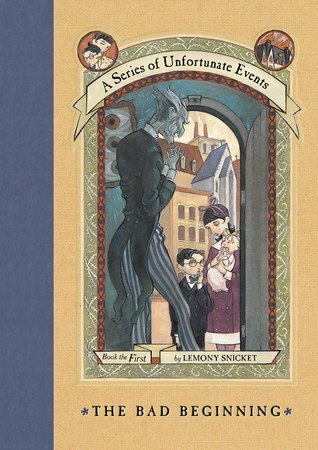 The first book was so magical and fun and probably should have ended there. The second book was okay, but really unnecessary. Then this last book was just boring and stretched out. I was okay with the love triangle until we reach this last book. Then it gets really annoying. For me, it annoyed me that she was so stuck on Morpheus when Jeb had sacrificed so much for her. Morpheus just pulled at her until she did what he wanted her to do the whole time. There wasn’t much about this book that I liked. I thought the ending would make me happy, as I had already read the last chapter before I read even the second book. I couldn’t help myself, it was sitting on the shelf at the library so I picked up the last book and read the last chapter. Had I stopped then and there I would have been okay with this trilogy. But reading the last book put a bitter taste in my mouth. I would suggest the first book, but stop there. First Thoughts: When I first found this book I instantly fell in love with the book. 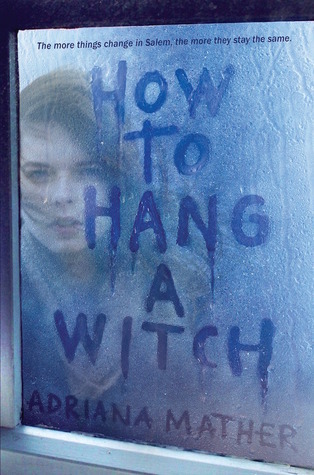 The cover is fantastic and the title…I am pretty much sold when it comes to witches. After reading the blurb for the book I knew I had to give this a read. The Salem Witch Trials is probably my favorite thing to check out when it comes to history. Review: Samantha Mather’s has moved to Salem, Massachusetts with her stepmother. Her father has been in a coma for 4 months and the medical bills have forced them to sell their home in New York and move into her fathers family home that was left to him when Samantha’s grandmother died. Sam quickly finds out that Salem is not going to be a friendly place for her. Her ancestors had a big part in the Salem witch trials and they still hold a grudge. Things quickly spiral out of control as threats are thrown through her window and even a ghost decides to make his dislike of her known. What I found great about this book is that there is actual history mixed in with the entertainment. It made me want to research the Salem witch trials more, just to see what all from the book was inspired by true stories of the Salem events. Samantha Mather is such a fantastic lead character. She is stubborn and she stays that way through the entire book. She is strong to a fault. She doesn’t want anyone to know what she is dealing with, which causes more stress and doubts then it actually helps. I felt like I could really connect to who Samantha was, being the new girl that no one liked. I could feel the emotions of being so alone and not being able to trust anyone. Of course, there is a little romance in the story, but not to the point where it overcomes or BECOMES the plot of the story. The story, in the end, is about a girl figuring out her history and trying to make right the things that had gone wrong so many years ago. The quote “The sin of the father” comes to mind, paying for sins (or wrongs) done by those before you. The End: WARNING! Their are spoilers in this section. Please skip to the “Final Thoughts” section if you do not want to read spoilers. I loved the relationship between Sam and Jaxon. I thought it was cute and it was great that Sam had a friend even when things were troublesome. But….I loved Elijah. I wanted Elijah to some how find a way to become human again and finish out a life that was ended too soon. Maybe Jaxon would have been with Sam the whole time had she told him what was really going on, but Elijah was there, through everything. It could also be that Elijah basically hated Sam at the beginning and then fell in love with her. I don’t know, but I may have weeped a little when Elijah said goodbye. Final Thoughts: I have read a few reviews written about this book and I realize that it’s not for everyone. I thought it was an amazing book. It was fast paced and full of action. Although, if you are not a fan of history, then maybe this book is not for you. The beginning of the book could possibly be a little slow, but I was hooked from the first chapter. There are so many questions hovering around Sam and her strange life, and everything is answered in the end. I would suggest this to friends, at least to give it a chance. There is a lot of hype around it at the moment, but I think the story was well worth the time. Okay, here is the secret behind…me. I don’t get into superhero movies. I feel like they have gotten so boring because it’s the same thing over and over again. Also, I never really connected with the superheros. I was always the strange girl that loved the bad guys. I mean…come on, they have way cooler costumes and tragic backgrounds. There just seems to be more to them. When you make a movie full of bad guys of course I am going to go see it! Even after all of the horrible reviews! The acting in this movie was fantastic. I feel like every actor that crossed the screen did a wonderful job. I may have jumped on the Harley Quinn band wagon after this movie as well. Margot Robbie was such a believable Quinn. She was crazy, bad, and under it all, just another girl in love. I want to be her after watching this movie. My favorite character was Deadshot (after Harley Quinn, obviously, because…girl power!) This was another character that was so great. Will Smith has never let us down with his acting…(except in that one movie he did with his son (After Earth) but that wasn’t his fault, that movie was just horrible) and he didn’t disappoint in this movie either. I could go through the list of characters and tell you what I loved about them all and rave about how great they performed, but I will save you from the boring. Jared Leto! Still no Heath Ledger Joker, but OMG so amazing! I was told that the Joker in the comics is actually abusive to Harley Quinn and pretty much uses her, but in Suicide Squad they have this crazy, psychotic love that…well, if I was a bad guy I would totally want their love story! 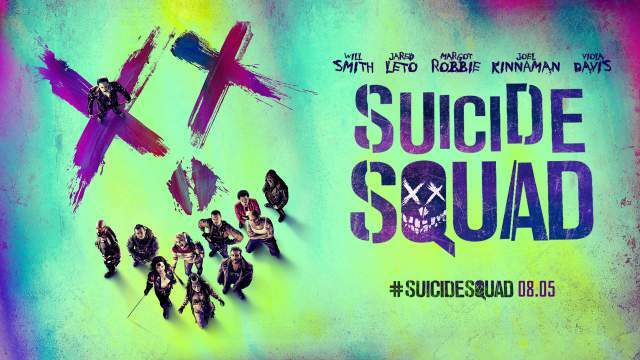 I realize that a lot of people dislike Suicide Squad, and I can understand what you don’t like. The story line was kind of all over the place, like they were given trouble, just to introduce the characters. The whole witch thing didn’t make much sense and I think I would have been okay with a movie just about the members of the Suicide Squad, without the lame storyline of them taking out this strange, old soul witch lady. Would I watch the movie again? You bet I would! Even with the horrible story line, it was action packed and the backstories were fabulous! I would even consider spending more money and going to the theaters to see it again…if I wasn’t broke at the moment. Honestly, it wasn’t as bad as the critics say it was. 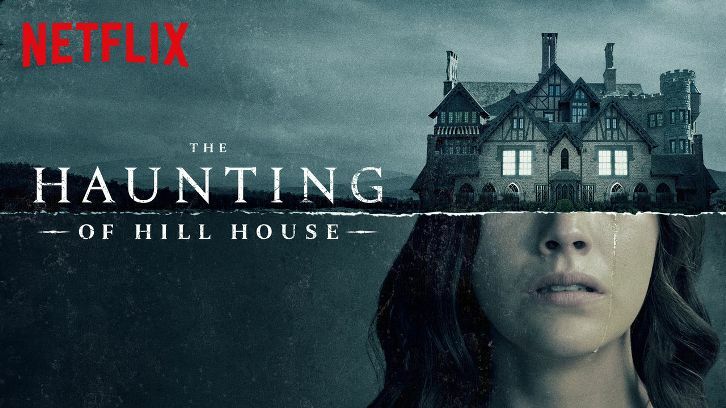 If you are looking for a interesting movie that will NOT put you to sleep, this movie will fit the bill. I had gone to work at 5 am the morning I saw the movie. This was after getting very little sleep the night before and no nap before seeing the movie. This usually means I will fall asleep in the theater if the movie is bad or not that great. This movie kept me awake and alert. I loved it. First Line: Walking to School over the snow-muffled cobbles, Karou had no sinister premonictions about the day. The cover is gorgeous and promises wonderful things. Karou was raised by monsters. She is all she knows as family. Brimstone, the head of this family, makes wishes and sends Karou out to collect teeth. What the teeth are for, she has yet to find out. Her life is full of questions and secrets. But that all soon changes when angels show up, marking the doors Karou has used all her life to get to Brimstones Shop. Without warning, Karou is cast out and all the doors are destroyed. She begins her quest to find her family and figure out the truth about who she is and what is going on. Okay, this book started out fantastic. I loved the idea of a human girl being raised by monsters. I was in love with the book almost from the very beginning. And even though Brimstone is such a tough character, I knew there was something more and loving with him. Though there is not much character development with him, he is still my favorite character. I think I lost interest in the story at the end. I promise, no spoilers other than, Karou does figure out who she is and what she has to do with everything that has happened recently. I felt like the story was promising for something amazing. I was intrigued from the start, but then it just kind of fell flat towards the end. I can’t really explain it. At the end I instantly opened the next book, but only a few chapters in I was bored again. There are just too many slow and bland parts in between the other parts. One thing I didn’t really understand is the fight that Akiva had with his ‘siblings’. (I’m too lazy to look up their names.) Akiva has fallen in love with this creature that they have been fighting, and they want to kill him or fight him because of it…yet they would throw themselves in front of the enemy to save one another? It doesn’t make sense. They have covered for Akiva before because he disappeared. Why couldn’t they cover for him again, or even say he had died in battle or something? I doesn’t make sense that they would kill or die for him, yet they wouldn’t allow him to love what they consider a monster/enemy. There is also the ending that really ticked me off. Karou has seen her past life. She knows who she is now and everything that has gone on with her and Akiva. She knows why Akiva has a sudden hatred for the monsters he had grown to…appreciate(?) but when she finds out that in his rage (caused by her death!) he has killed all of the chimera. I get it…he killed her people, but in the end, wasn’t it because of her, for her? I had high hopes for this book. I had heard so many fantastic things about it and a few people were just so in love with this book. I thought I would fall in love with it too, but I didn’t. In all honesty, I am probably going to trade this entire series for credits at my local book store, or keep it only for the gorgeous covers. Who knows. The concept is fantastic. The whole wish making thing, the battle between the angels and chimera, and the human girl being raised by monsters. I loved the idea, but the story fell a little flat for me. Maybe the love story messed it up for me…I don’t know, I just don’t think I will be finishing this series. It feels like it would be a waste of my reading time to even try. Then again, I could get super curious later on and come back to it. But as it stands right now, this series will be moved off my TBR list and to the bottom shelf where I put the books I don’t really like. Sorry, to those of you who loved it. Maybe you could share with me what you loved and I could try to understand?